In respect of international shipping using ocean freight services, shipping Dangerous Goods means international shipping of substance or material, which has been determined to be capable of posing a risk to health, safety, and property when transported in commerce. In respect of U.S. domestic cargo transportation, the equivalent term Hazardous Material (HAZMAT) used. The shipping term Hazardous Material (HAZMAT) used almost exclusively in the United States. Then in respect of international shipping of ocean freight, Hazardous Materials will be classified as Dangerous Goods when transported by an international ocean freight carrier from or to the USA. In international shipping of Dangerous Goods, everything is strictly regulated: the shipping documents, labeling, packing, marking etc. Dangerous Good in ocean freight require an approval from an international ocean freight carrier prior to scheduling an international ocean freight shipment. Dangerous Good may only be shipped after the approval AND subject to surcharges on the ocean freight. International shipper is always held responsible to identify, declare and provide all necessary documents related to international shipping of dangerous goods, in proper form acceptable by international ocean freight carrier, in advance. Any delays and/or increasing of ocean freight shipping costs due to improper identification, classification and/or incorrect or missing documentation related to an international shipping of Dangerous Goods in ocean freight will be responsibilities of the shipper. International ocean freight shipments containing hazardous goods may require more transit time than regular international ocean freight shipments (export or import) from or to the USA. Most international ocean freight carriers will NOT approve acceptance of dangerous goods other than IMO Classes 3, 8 & 9. International shipping of dangerous goods other than classes 3, 8 & 9 requires a special ocean freight carrier with a specialized equipment used to transport dangerous goods of particular classes. UN NUMBER - stands for United Nations number. The UN number is a four-digit number assigned to a potentially hazardous material (such as gasoline, UN 1203) or class of materials (such as corrosive liquids, UN 1760). Firefighters and other emergency response personnel use these numbers during transportation emergencies. UN (United Nations) numbers are internationally recognized. FLASH POINT - is the lowest temperature at which the material can catch fire. PACKING GROUP - grouping according to the degree of danger presented by hazardous materials. Packing Group I indicates great danger; Packing Group II, medium danger; Packing Group III, minor danger. DECLARE DANGEROUS GOODS TO AN INTERNATIONAL SHIPPING COMPANY USED IN YOUR OCEAN FREIGHT SHIPMENT IN ADVANCE! INTERNATIONAL SHIPPERS MUST DECLARE DANGEROUS GOODS TO BE SHIPPED USING OCEAN FREIGHT SERVICES, AND GET AN APPROVAL FORM THE OCEAN FREIGHT CARRIER, BEFORE CARGO WILL BE SUBMITTED TO THE INTERNATIONAL SHIPPING. To declare Dangerous Goods for the international ocean freight shipment, before scheduling the shipment, shippers must complete and submit to an international shipping company used for the shipment a Dangerous Goods Declaration in a proper form acceptable by the international shipping company. Then, upon the approval, it will be submitted along with the international shipment to the international ocean freight carrier. In order to submit a Dangerous Goods Declaration properly, we suggest you requesting a manufacturer or seller of your shipped goods for necessary information. 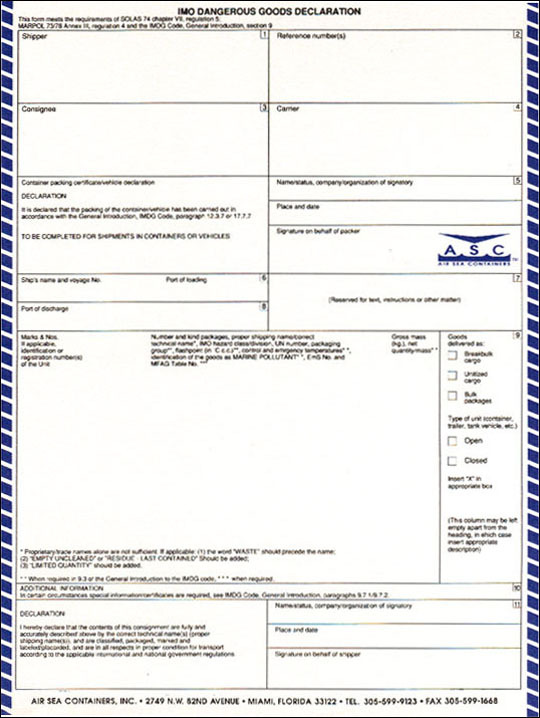 Here is a sample of form of Dangerous Goods Declaration used in international shipping of ocean freight. It is a good idea to prepare a HAZARDOUS CARGO REQUEST in advance and submit it along with your import or export quote/booking request. I respect of international shipping of sea freight, many dangerous goods are incompatible with other substances. They may react with other dangerous goods shipping internationally or chemicals, or with apparently harmless substances, such as dust, air or water. Dangerous goods can easily come into contact with incompatible substances through spillage or leakage, and may liberate toxic gases, or cause a fire or an explosion. 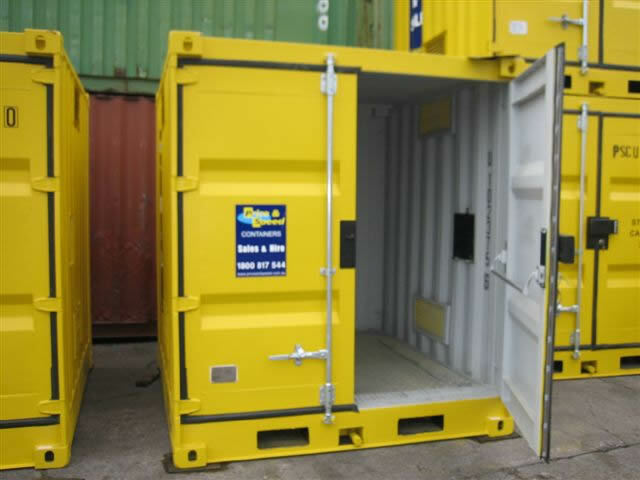 It is a legal requirement that international shipping dangerous goods not compatible with other substances are stored and handled separately so that a loss of containment or interaction cannot cause a serious incident. This can be achieved by use of an impervious barrier or a suitable separation distance. That international seafreight carrier and other parties involved in the segregation will not be responsible for any damages, loss of cargo etc when the international seafreight carrier/warehouse does the segregation. That the international shipper guarantees to pay to the international seafreight carrier segregation charges. Notice: International moving companies most likely will not accept responsibilities on international shipping of Dangerous Goods/Hazardous Materials.